In the second volume of The Books of Wonder Tommy Wonder describes what he calls a Frozen Lock . 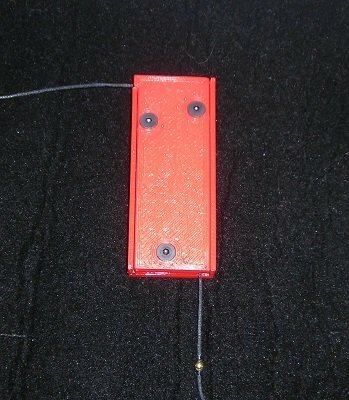 This is a utility device for the Jack Miller holdout, but it can also be used for other holdouts and pulls. It allows one to keep the holdout higher up in the sleeve until you want to lower it. Exactly how this works and how it should be used is something you will need to read in Tommy's book. This item comes with no instructions. I am assuming customers know how it is being used. Tommy Wonder produced his lock from brass. However, brass is not necessarily the best material for this type of device, because it is heavy and louder than it has to be. That is why I decided to 3D print this in plastic which makes it a lot lighter and less noisy. There is still a clicking sound, but since this lock is worn inside the sleeve it will not be heard during performance. Besides the more suitable material it is also improved functionally. My version has two inlet channels, one straight, the other 90 degree rotated. This gives you two options to run the holdout cord. Depending on where you want to place the lock you will find one or the other to work better. If you place the lock further down in the sleeve the straight inlet is typically best. If you have it higher up in the armpit or shoulder region you will find that the 90 degree rotated inlet is the better one. The 90-degree inlet prevents that the cord kinks just at the inlet to the lock and possibly prevent its proper operation or fray the cord over time. The lock consists of two pieces and three M4 flat head screws. You will NOT receive a cord or bead. Your holdout cord should be about 1 mm in diameter and you will need a bead of about 3 mm mounted to the cord. (Tommy Wonder writes more about the bead and cord in his book.) The lock is identical in width and height to what Tommy describes in his book, but it is 15 mm longer to accommodate the dual inlet channels. Dimensions are 85 mm x 35 mm x 13 mm. The video below shows the basic function of the lock. Pulling on the top sets the lock in its locked position. Another small tug at the top frees the lock and the cord can now run uninhibited. It can be locked and unlocked as often as you want. And since the lock has no moving parts (the only thing moving is the cord and bead), it is a remarkably reliable mechanism.